IS TED CRUZ A PRODUCT OF STRICTLY FOREIGN INFLUENCE? (Apr. 19, 2016) — Late on Monday, an individual in the United States contacted The Post & Email to advise that he had received images of a birth and death certificate, respectively, for Michael Wilson, the five-month-old child born to presidential candidate Ted Cruz’s mother while she resided in the UK in 1966. Many constitutional scholars believe that the Framers of the Constitution wished to preclude foreign influence from entering into the office of the nation’s chief executive as evidenced by a letter written by future U.S. Supreme Court Chief Justice John Jay to George Washington, who was presiding over the Constitutional Convention of 1787. “Permit me to hint, whether it would not be wise & seasonable to provide a strong check to the admission of Foreigners into the administration of our national Government, and to declare expressly that the Command in chief of the american army shall not be given to, nor devolved on, any but a natural born Citizen,” Jay wrote on July 25 of that year. Washington later responded, “I thank you for the hints contained in your letter.” The “natural born Citizen” requirement was reportedly adopted without debate for the office of president only. In late January, The Post & Email paid for and obtained a certified copy of Darragh’s birth certificate from the State of Delaware, as vital statistics records, although initially protected by law, become releasable to the public after 72 years. On Tuesday, The Post & Email interviewed the individual, who we will call Jim Redding, as to what prompted him to hire a researcher to “obtain birth and death records for British subject in ’66” as stated when he placed his idea “out to bid” through a service with which freelance professionals register their services. “Within 48 hours, I received a response from an individual who said, ‘I can get these for you,'” Redding told us. The researcher provided the tracking number assigned by the UK’s Royal Mail to the envelope on Monday, when it was taken from Dorset Mail Centre to Heathrow Worldwide DC on the first leg of its overseas journey. The jpeg images reveal that the child, who died at the age of five months, bore the name “Michael Darragh” on his birth certificate but “Michael Wilson” on his death certificate. The Dallas Morning News first reported in August 2013 that Ted Cruz was born a dual Canadian-U.S. citizen, which Cruz initially denied. Within a day, however, he vowed to renounce his Canadian citizenship, stating that as a U.S. senator, he should be “only an American.” Even then, it was speculated that Cruz would run for president in 2016 despite Fox News’s initial statement by political reporter Carl Cameron that Cruz was ineligible due to his foreign birth. Although controversy exists over the “natural born Citizen” provision of the Constitution, it has been generally understood that “a naturalized citizen cannot serve” as president. Some legal scholars believe Cruz is eligible based on the “citizen-from-birth” theory which has emerged since Cruz announced his presidential intentions, while others contend that anyone born outside the country, even to two U.S.-citizen parents, is ineligible. Wilson makes a brief appearance in Cruz’s book, A Time for Truth: Reigniting the Promise of America, which was published last year. “In 1956, my mom married her first husband, a mathematician named Alan Wilson,” Cruz wrote. The couple moved to London in 1960 after a few years working in the U.S., and Cruz revealed something of a bombshell: his mother had given birth to a son, Michael Wilson, in 1965, who had died a crib death later in the year. However, on the death certificate, Alan Wilson is listed not only as the person reporting the baby’s passing, but also his father. Contrary to what Alan Wilson reportedly told McClatchy, the “name on the birth certificate” is “Darragh,” not “Wilson,” while the latter appears as the baby’s last name on his death certificate. While Cruz reportedly wrote in his book that his half-brother, Michael Wilson, died of “crib death,” the official reason provided on the death certificate is “acute bronchitis.” Additionally, the child was born and died in 1966, not 1965. According to McClatchy, Alan Wilson said that he and Eleanor divorced in 1963. With Cruz’s connections to Canada, Cuba and Spanish-speakers, and the United States, some have speculated that Cruz is the “North American Union candidate.” “When you think about it for a minute, how neat would it be for the planned North American Union to have Ted Cruz as President? Joint citizenship in the U.S. and a Canadian citizen — who is Hispanic and can speak Spanish?” wrote Marilyn Barnewall in her column at NewsWithViews.com on February 17. Eleanor was never a citizen of Canada, and she could not have been under the facts or the law. In short, she did not live in Canada long enough to be a Canadian citizen by the time Cruz was born in 1970: Canadian law required 5 years of permanent residence, and she moved to Canada in December 1967—only 3 years before Senator Cruz’s birth. Nothing in the document you sent shows anything to the contrary. First, the document itself does not purport to be a list of “registered Canadian voters.” All this might conceivably establish is that this list of individuals (maybe) lived at the given addresses. It says nothing about who was a citizen eligible to vote. Second, the document is from 1974. That is four years after Senator Cruz was born, so even if this document said anything about citizenship—and it does not—it would be irrelevant to the citizenship status of his mother at the time of his birth, which is the only relevant status for determining Cruz’s natural-born citizenship. The law was amended in 1977 by the Citizenship Act, which removed “special treatment” for British subjects and recognized dual citizenship. In May 2014, Ted Cruz renounced his Canadian citizenship by submitting the required application and $100 fee, nine months after The Dallas Morning News reported that he possessed it. Page 2 of the application asks the individual so renouncing whether or not he possesses, or will soon possess, citizenship in another country so as to prevent statelessness. Other than a blank sample, the application is not releasable under Canadian law without a signed privacy waiver. Cruz has repeatedly ignored requests to release more documentation about himself, particularly that which would connect him to U.S. citizenship. According to divorce documents acquired by RadarOnline.com pertaining to Rafael and Eleanor, they were married on March 14, 1969. Divorce records can be obtained through Texas Public Information Act requests, as they are not protected from release by state law. McClatchy also reported that Eleanor and Rafael married in 1969. Neither source reported where the marriage allegedly took place. Michael Wilson does not appear to have been registered as a U.S. citizen born abroad, and many have questioned why Ted Cruz has not released a “Consular Report of Birth Abroad,” or CRBA, to show that he was designated as such following his birth in Canada. Cruz may, in fact, be a Cuban citizen due to his father’s citizenship when he was born. Using the anchor baby as leverage, my guess is that that is how she obtained her UK credentials. The Post & Email will continue its interview with the researcher in a second installment. Ted Cruz Announces Run for Second Term in U.S. Senate, But Is He Eligible? Did Ted Cruz’s Mother Become a British or Canadian Citizen? 40 Responses to "Breaking: Exclusive: Birth, Death Certificates Raise Questions as to Evolving Life Narrative of Ted Cruz and Parents"
We do not know if Cruz holds U.S. citizenship, as neither the State Department nor USCIS will release any of his documentation, if it exists, nor will Cruz. He has not released his application to renounce Canadian citizenship, which asks if the applicant possesses or will soon possess citizenship in another country, and the Canadian government will not release the document without his written consent. Neither the Texas Secretary of State nor the governor will say whether or not they possess documentation that Cruz is a U.S. citizen. Ted Crus is ineligible to be either President of U.S. Senator because he remains a Canadian citizen. He purportedly renounced his Canadian citizenship but to be eligible he had to have or was seeking another citizenship. He did not have nor does he now have American citizenship. Reference: Osborn v Bank, 22 U.S. (9 Wheat) 738 1.c 827 (1824);Ozawa v United states, 260 U.S. 178(1922);Weedin v Chin Bot, 274 U.S.657 1.C. 663 (1927); United States v. Perkins, 17 F. Supp. 117 (1937); City of Boerne v. Flores, 501 U.S. 507 (1997); Calvin v Smith 77 Eng. Rep. 377 (1608); Comments by Blackstone in 1765; Papers by James Madison 22 May 1989; U.S. Department of State Foreign Affairs Manual Vol 7, Not including in the meaning of “in the United States @c. (8-21-2009; Comment of Attorney General George Henry Williams on the 14th Amendment in 1883; judicial determination on ineligibility of George Romney to be president by Pickney G. McElwee of the D.C.Bar in the Congressional record of 6-14-1967; Civil Rights Act of 1866; the 14th Amendment to the Constitution; the 1866 discussion of the framers of the 14th Amendment regarding jurisdiction “Not owing allegiance to anybody else”; United States v. Rhodes,17 F. Cas. 785 (1866);Elk v Wilkins, 112 U.S. 94 (1884. In United v. Perkins, a federal court denied a plaintiff with the identical birth circumstances as Cruz for not meeting the 14th Amendment. The information provided below comes from ACTUAL HISTORICAL statements from the 14th Amendment & 1872 Citizenship Debate transcripts which are contained within ‘The Congressional Globe’; U.S. Supreme Court Rulings; Statements made by Cruz, his father, Alan Wilson interview, and other sources as found on online. Cruz keeps citing in his responses the Act of 1790 (long-standing U.S. Law) which did state that children born abroad to U.S. citizens (plural not singular) were considered ‘natural-born citizens’. HOWEVER what Cruz is NOT telling American citizens is that the Act of 1790 was REPEALED as in voided, voted out, nullified, NO LONGER LAW and REPLACED with the Act of 1795 which changedonly grants the ‘status of citizen’ NOT natural born to children born abroad to U.S.citizens (again plural). Why plural, because at the time these acts were written a woman with U.S. citizenship who had a child born abroad could not confer her U.S. citizenship onto her child – it could ONLY descend through the father. That right did not come into effect until the 1900s and only convey’s ‘citizen’ status ‘granted’ through naturalization process. b) If it is determined that the child can hold U.S. Citizenship a Consular Report of Birth Abroad and/or a U.S. Passport would/will be issued to the parents who MUST ALSO RENOUNCE THE child’s Canadian (or other country’s) citizenship AT THE SAME TIME. c) If his mother did not report his birth to the Consulate, she and Ted Cruz had to do so before he reached Age 18 at which time he was required to take an ‘OATH OF ALLEGIANCE’ to the United States AND ‘RENOUNCE ANY PREVIOUS FOREIGN CITIZENSHIP’. d) If he failed to do so by Age 18, then he loses the eligibility to claim U.S. Citizenship and the only way to acquire it is to go through the ‘normal naturalization process’ that EVERY IMMIGRANT COMING TO AMERICAN MUST GO THROUGH TO BECOME A U.S. CITIZEN. Cruz has NOT produced his Consular Report of Birth Abroad, a very important document as it would clearly state that he held U.S. Citizenship, however he would only be a ‘naturalized’ citizen as it is again, governed under the Immigration & Naturalization Act, which ‘grant’s citizenship PROVIDED CERTAIN REQUIREMENTS ARE MET (discussed in Part 5). One is NOT automatically ‘born’ with it, nor is it descended upon the child from the parent. This is coming from a man who is ‘supposed to be a Constitutional lawyer’ who knows full well that without a CRBA, without any ‘U.S. Naturalization’ papers, he HOLDS NO U.S. CITIZENSHIP WHATSOEVER. It also MUST BE NOTED, that in 1970 Canada did NOT recognize Dual Citizenship and the parents of ANY child born in Canada who either both or one was a foreign parent HAD TO DECLARE UPON BIRTH WHICH CITIZENSHIP THEY CHOSE FOR THE CHILD. Canadian officials say Ted Cruz was (since renounced) a ‘natural born Canadian citizen’ and nothing else, and this can only mean that his mother claimed Canadian Citizenship for Cruz which is why he did not RENOUNCE said citizenship until May 2014. D) U.S. SUPREME COURT RULING DEFINES ‘NATURAL-BORN CITIZEN’: Perkins v. Elg, 307 U.S. 325 (1939), U.S. Supreme Court of the United States Ruling was that a “child born in the United States to naturalized parents on U.S. soil is a natural born citizen” and that the child’s natural born citizenship is not lost if the child is taken to and raised in the country of the parents’ origin, provided that upon attaining the age of majority, the child elects to retain U.S. citizenship “and to return to the United States to assume its duties.” Not only did the court rule that she did not lose her native born Citizenship but it upheld the lower courts decision that she is a “natural born Citizen of the United States” because she was born in the USA to two naturalized U.S. Citizens. The Supreme Court of the United States has never applied the term “natural born citizen” to any other category than “those born in the country of parents who are citizens thereof”. The Constitution states the Congress shall only have the power to determine a ‘naturalization process’ for citizens and who will be classified under the process as U.S. Citizens. In order to determine who would be eligible to become naturalized U.S. Citizens, the House of Representatives had to define what a ‘natural born citizen’ was. 1866 during 14th Amendment House debates, Ohio Representative John Bingham, known as the Chief Architect and Father of the 14th Amendment stated: “I find no fault with the introductory clause, which is simply declaratory of what is written in the Constitution, that every human being born within the jurisdiction of the United States of parents not owing allegiance to any foreign sovereignty is, in the language of your Constitution itself, a natural born citizen; but, sir, I may be allowed to say further, that I deny that the Congress of the United States ever had the power or color of power to say that any man born within the jurisdiction of the United States, and not owing a foreign allegiance, is not and shall not be a citizen of the United States.” John A. Bingham, (R-Ohio) US Congressman, Architect of Section 1 of the 14th Amendment, March 9, 1866 Cong. Globe, 39th, 1st Sess., 1291 (1866), Sec. 1992 of U.S. Revised Statutes (1866), Cf. U.S. Const. XIVth Amend. In this Bingham cites 2 factors that declares Dr. Houard to be a “natural-born citizen”: born of citizen “parents” (plural not singular therefore requiring you to have 2 U.S. Citizen parents for this status) AND born within the ‘jurisdiction of the United States. PART 4: WHAT IS SUBJECT TO THE JURISDICTION THEREOF MEAN? ‘Natural-born Citizen’ as defined by the very person responsible for the writing of the 14th Amendment, Ohio Representative John Bingham requires 3 things: that you are born within the jurisdiction of the United States, that BOTH parents are citizens of the U.S. either by naturalization OR by being natural born themselves AND that both parents must NOT owe ANY allegiance to ANY FOREIGN country. CRUZ was born in Canada and NOT WITHIN THE REPUBLIC/JURISDICTION OF THE UNITED STATES. Even if his mother was still a U.S. Citizen, his father WASN’T, thus per Bingham Cruz does NOT meet the requirement that BOTH parents MUST be U.S. Citizens and therefore he is NOT a natural born citizen. His father was also a Canadian citizen and thus owed allegiance to Canada NOT the U.S. That disqualifies him. And if Cruz’s mother was a Canadian Citizen as the Canadian records indicate then its obvious that Cruz was not a natural born U.S. citizen at birth, but instead a Canadian citizen. Cruz’s mother married Alan Wilson in 1959 and they moved to London, England in 1960. She divorced her first husband in 1963 (per Alan Wilson). and continued to live in England until sometime after the death of a child she had (out of wedlock), Michael Wilson (not Alan Wilson’s son – he says they were definitely divorced but agreed to allow her to use his last name for the child). London records identify a Michael Wilson was born and died in 1966 and was buried in Kensal Green Cemetery in Kensington, a London neighborhood. Eleanor then returns to Houston sometime in 1966 after the crib death of her son, where she meets Rafael Cruz. Rafael Cruz states that they moved to and were living in Canada sometime around 1966-1967 (he states they lived there for 8-years returning in 1975 so that makes it 1967. Canadian records show an address for them in 1975 in Calgary). He states he became a Canadian Citizen in 1968 and that he and Eleanor were married sometime around 1967-1968 (Ted says 1969) but where…Canada? Most likely. Non one can find a Marriage license for them here in the States. Because Cruz’s mother lived in London from 1960 to sometime in 1966 after the death of her first son, and then almost immediately ends up in Canada with Cruz sometime around 1967, she CLEARLY did not meet the required 10-year physical U.S. residency requirement which requires that at least 5 of those years must be spent physically within the U.S. BEFORE the birth of the child. (Alan Wilson continues to live in London and is still a U.S. citizen. As previously mentioned, at the time Cruz was born in 1970 Canada did not recognize dual citizenship and per their laws if you are born on Canadian soil (and even today in an airplane over Canadian airspace) you are a Canadian born citizen only (in 1970). Their dual citizenship clause was changed in 1977. Additionally, there is a documented report that Cruz’s parents voted in the 1974 Canadian Federal elections as Canadian citizens. This document can be found in Canadian government online searches. As for her possible Canadian citizenship, Canadian law at that time states that a foreign spouse (in this case Cruz’s mother) who was married to a Canadian Citizen (his father became one in 1968) and lived in Canada with said Canadian spouse (her husband) for 1-year AUTOMATICALLY became a Canadian citizen, which would account for the information that they voted in 1974 as Canadians and that their names appear as Canadian Citizens on the 1974 Canadian Election Voter list. This could quite possibly be the reason why Cruz hasn’t produced a Consular Report of Birth Abroad to substantiate his U.S. citizenship because he doesn’t have one. It is up to the U.S. Consulate to determine Cruz’s birth citizenship and if his parents went to the Consulate to report it, the Consulate most likely refused to ‘grant’ U.S. citizenship based on the fact that Cruz’s parents were Canadian citizens by virtue of his father becoming one and his mother meeting the statute of being married to one and living in the country for the 1-year required time, as well as Ted being born on Canadian soil which makes him a ‘natural-born CANADIAN’ citizen just like Rand Paul stated. Per Canada, they stated Ted was/is a Canadian and nothing more. It has become rather obvious that she did not report his birth OR OBTAIN a CRBA. How do we know this? c) …claim his U.S. Citizenship by age 18, RENOUNCE his Canadian Citizenship AND take an ‘OATH OF ALLEGIANCE to the U.S.” If he didn’t, then after age 18 he would have to claim said citizenship through ‘normal immigration/naturalization process’ that all immigrants must go through to become a U.S. Citizen and it is apparent that he didn’t do any of that as he did not renounce his Canadian Citizenship until 2014. “Senator Ted Cruz” Not only is an illegally sitting Senator, he also HAS NO U.S. AMERICAN CITIZENSHIP AT ALL! NONE! Cruz only had “1″ U.S. Citizen Parent and that does not make him ‘natural born’. So, if the Governor of Maine’s children are not considered natural-born and a re only ‘naturalized’ so is Cruz and that makes him ineligible…and more…HE KNOWS IT! SENATOR MAZIE HIRONO IS A NATURALIZED CITIZEN, SO HOW IS CRUZ ‘NATURAL-BORN’? CRUZ ENTERED U.S. ILLEGALLY IN 1974 AS “ILLEGAL ALIEN” AND WORKED IN OUR GOVT. AS “ILLEGAL ALIEN FOR YEARS!! STILL “ILLEGAL ALIEN” until Cruz became U.S. citizen 18 mos. ago and dropped his Canadian birth citizenship. Squatted on our land and worked in govt. as an “illegal alien.” He is more than ineligible to be Pres. and needs to be deported. How does an “illegal alien” get permission to sell our land to a ME country? Huh? CRUZ SOLD SHELL OIL COMPANY IN HOUSTON, TX, TO SAUDI ARABIA ALONG WITH 14,000 ACRES OF LAND (to grow alfalfa) IN CA FOR 170,000 COWS AND THEN WE HAVE TO BUY MILK FROM SAUDI ARABIA??? WISCONSIN WAKE UP. AMERICA WAKE UP. CRUZ NEEDS TO GO! It does appear that Rafael B. Cruz and Eleanor Darragh Wilson went to Canada when Rafael was still legally married to Julia Garza. Rafael Cruz and Julia Garza were married in 1959. Per Court Records she ‘filed for divorce in November 1996’ – Rafael says they were divorced 3-years after they were married. Ancestry.com has Divorce documentation for Rafael Cruz and Eleanor Darragh Wilson as being divorce on February 13, 1997. That is only a 4-month difference between Wife 1 filing for divorce and Wife 2 being granted a divorce! It appears that Rafael had a wife in the United States AND a wife in Canada, which is most likely where the two married (if they did in fact married, and if they didn’t Ted Cruz is most definitely NOT a U.S. Citizen as an un-wed mother MUST HAVE LIVED THE YEAR PRIOR TO BIRTH IN THE U.S. – Eleanor lived in England from 1960 – Dec 1966 and then in Canada from 1967 to 1975. Does not meet physical residence in the U.S. for married (10-years prior to birth of child) or 1-year prior. Is this something else Cruz is trying to hide. The fact that his father was married to 2 women at the same time? It would not surprise me if Cruz’s mother used the birth certificate of her dead child to bring Ted to the United States of America. That would be the reason to SEAL all his records !!!! There is no reason for the mother what Ted Cruz to not produce the records that allowed him to enter United States of America. My question is what records did he use to enter school? Although he renounced his Canadian citizenship could Ted Cruz still be a Cuban citizen because his father was still a Cuban citizen at the time of Teds birth? Leo Donofrio has done some great work on this topic, and cites Minor v. Happersett as the case that is relevant and on point that show both Obama and Cruz are ineligible. It is worth noting that the law site Justia manipulated and scrubbed references to this case because of its threat to expose this ongoing lie that currently occupies the Oval Office (and the one who seeks so succeed him). The fact that the Supreme Court has articulated, with precision, what constitutes natural-born status in many of their findings beginning in 1814, not thirty years after the US Constitution’s creation, seems not to have any bearing at all. The fact that the Congress has brought forth eight Bills between 2003 – 2008 to modify or eliminate the Natural Born Citizen requirement to hold Office as POTUS speaks volumes simply because of the timing; just prior to Obama arriving on the scene. Why are we presented with so many candidates that educated citizens find unqualified? Ted Cruz’s parents should have listed Ted as a US citizen born abroad. I have a feeling they probably didn’t so they could receive Canadian health insurance. At the time they intended to stay in Canada forever. They only left because the oil business was no longer booming. The main purpose of the “natural born citizen” clause is because the founding fathers of the US did not want people from other nations controlling their country. A child born abroad by a US citizen either mother or father is considered a US citizen. The purpose was in case a citizen gave birth while on a short trip to another country. It was not intended for people who actually moved to and worked in another country. That is what Ted’s family had actually done. there are errors in the “mother lode” link in the prior article which I believe have been or will be corrected. Sharon, thank you so much for your amazing work. The website below contains some information regarding possible British citizenship for Cruz’s mother. It states that Cruz’s mother might possibly have obtained British citizenship as the wife (either by marriage certificate or possibly by common law marriage) to the father of Michael Wilson. If this man were British, the law listed below would apparently apply. i posted the rafael/julia separation and divorce documents on your site. they were divorced in 1968. a default was issued against rafael (my assumption was that he failed to respond to the petition for an absolute divorce filed by julia). it is also my assumption that rafael and eleanor had already split for canada before the petition for divorce was even filed. i wouldn’t be surprised that they were in canada shortly after the petition for separation was filed in 1967 because rafael also had a default issued against him, again probably for failure to respond to the petition for separation. a real stand up guy who dumps his wife and children to skip the country avoiding conscription during viet nam while shacking up with eleanor. that is my conclusion after looking at documents and examining the timeline i have been able to put together. and, oh, by the way, this is ted’s hero, the guy he looks up to and his go to guy for campaign speeches. can you just imagine this group in the white house? Great work, as usual, Sharon. Cruz appears to be Obama2.0 and his parents operatives as well. The US Constitution is the supreme law of the land. So, anyone who knowingly and willfully violates the US Constitution is a criminal, right? “natural born Citizen” is a wise 1789 mandate of the US Constitution. Not a suggestion, but a standard of human behavior; a living mandate in 2016. So, our nation’s entire governmental structure 08-28-08- TODAY is a syndicated tax-paid-for omerta-like criminal enterprise for openly, notoriously and continually deciding to actively silence the US Constitution’s living mandatory 1789 requirement, “natural born Citizen”. ALL TALK AND NO SHOCK 08-28-08- TODAY has earned us zero victories relative to the open violation of the living 1789 definition of “natural born Citizen” (= Obama-Cruz living usurpations). ID Thief-in-Chief Barry Soetoro-Barack Obama and his copy-cat ID Thief Rafael Cruz are Constitutional prisoners on furlough, fugitives-at-large, relative to their syndicated leadership in willfully and openly and notoriously violating the living legal 1789 meaning and intentions of the “natural born Citizen” mandate all during The Pelosi-Obama Sedated Sedition 08-28-08- TODAY. So, why don’t we folks simply keep our tax payment dollars secure at our homes, en mass, until after Barry and Rafael are fully identified on humanity’s “knowledge equality” Internet, lest We the People continue to criminally fund the subversion of our own US Constitution? ANSWER: WE THE PEOPLE 08-28-08- TODAY PREFER TO COMPLAIN LIKE WIMPERING DERELICTS RATHER THAN TAKE ACTION/CONTROL OF THE ONE THING WE CONTROL OVER THE NATION’S ENTIRE GOVERNMENTAL STRUCTURE, BEING, THEIR LIFEBLOOD/OUR TAX DOLLARS! Until We the People rise up from complicit IRRESPONSIBLE tax-paying subjects to RESPONSIBLE tax-withholding Citizens-With-A-Purpose en mass, we remain an entire disheveled nation of bankrupted complicit Constitutional criminals 08-28-08- TODAY! Keep suffering, America 08-28-08- TODAY, We the People’s DERELICTION OF DUTY PAID FOR KNOWN CRIMINAL ID THIEF-IN-CHIEF SOETORO-OBAMA TO DELIVER HARM AND HUMILIATION TO US ALL…AND HERE’S OUR JUST REWARD, A GIFT THAT KEEPS ON GIVING: http://www.usdebtclock.org/ ! Here is legal citation, source for the death document if you need to include in a media article. Ancestry.com. Reports of Deaths of American Citizens Abroad, 1835-1974 [database on-line]. Provo, UT, USA: Ancestry.com Operations, Inc., 2010. Reports of the Deaths of American Citizens, compiled 01/1835- 12/1974. Publication A1 5166. NAI: 6138 57. Record Group 59. National Archives at College Park, Maryland, U.S.A.
Record of Death Notices of U.S. Citizens Aboard, 1835-1855. Publication A1 848, NAI: 122 7672. Records of District Courts of the United States, Record Group 21. The National Archives at College Park, Maryland, U.S.A. Notices of Deaths of U.S. Citizens Abroad, 1857-1922. Publication A1 849, NAI: 122 7673. Records of District Courts of the United States, Record Group 21. The National Archives at College Park, Maryland, U.S.A. Yes, although that document must be authenticated. Excellent work Sharon! When you put things in perspective sounds like Obama and his purported mother. Many husbands, bounced all over the globe, hard to trace. Sharon: First of all thank you for helping me reconnect with the Birther Report Website.It seems that my browser from either Bing or Microsoft forgot the address of birther report website because I was not using the www intro for the website.I now access easily as I did several weeks ago now.As for Ted Cruz’s Presidential eligibility.There is no way that Cruz is a Natural Born Citizen with the Constitutional ability to acquire the office of President or Vice President.There exists a modern Supreme Court ruling in 2011 that says just because a person is born abroad to a single USA citizen parent DOES NOT MAKE SUCH AN INDIVIDUAL a NATURAL BORN USA CITIZEN! Congress passed a Law ALLOWING a single citizen parent in a foreign country to pass on their USA citizenship status to their child.Whenever a man made Law is required to make foreigners a USA citizen even from a single citizen parent,the child in every case can ONLY be considered a NATURALIZED citizen NEVER EVER Natural(NATIVE) Born Citizen.Just because Ted Cruz was not required to take a written test and appear before a Judge to be sworn in as a citizen,Cruz IS NOTHING MORE THEN ANY NATURALIZED USA CITIZEN DESPITE his birth circumstances.Ted Cruz is a NATURALIZED USA CITIZEN HAVING BEEN BORN ON FOREIGN SOIL!Naturalized USA citizens can NEVER seek High office in the USA.I should know because like Former Governor of California Arnold Schwartzneggar who desired to be a USA President after his terms as Governor of California ended,his naturalized USA citizen status PREVENTED Schwartzneggar from seeking the USA Presidency.Even recently Arnold still laments that he was PREVENTED by the USA Constitution to further his political aspirations.I too am a Naturalized USA citizen having been born in Munich,Germany and Naturalized in 1969.The Constitution allows only NATIVE born citizens on USA soil to two USA citizen parents to ever be a USA President or Vice President.So deceptive Ted Cruz having been born on FOREIGN soil can NEVER EVER be a NATIVE born citizen on USA soil EVER!It IS IMPOSSIBLE! How America’s Judicial court system cannot understand the definition of a Native(Natural) born citizen is extremely frustrating for those of us non Lawyers who easily understand exactly what the framers meant by the SIMPLE concept!Like Obama before him, the Judicial system in America is allowing a foreign born individual to violate America’s Constitution by boldly and arrogantly seeking America’s Highest office reserved only for Native born citizens born on USA soil.Having argued legal cases before the US Supreme Court Ted Cruz is fully aware of his Constitution violating behavior.Ted Cruz needs to be arrested by Law enforcement authorities for deliberately violating America’s Sacred Constitution.Sacred because of the blood and lives Lost that America in 2016 can still enjoy Liberty.Those who have sworn to protect and defend the US Constitution must do the arresting and arresting Cruz for breaking Constitutional Law! If you look at the Death of American Citizen document. 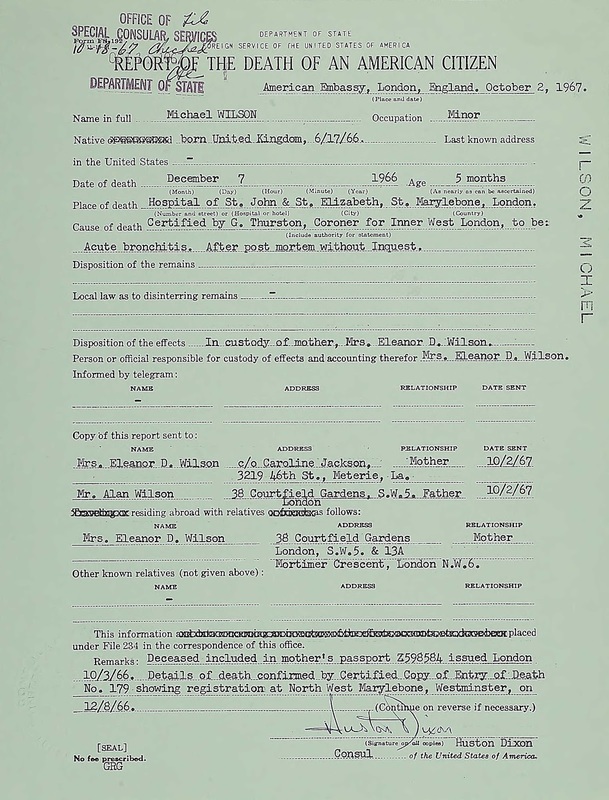 It says that Michael Wilson was added to Elenore Wilson’s US passport in October, 1966. Yes, but what is the source of the document? also note the consular document also says acute bronchitis as cause of death as in the body of this posted article, date of death was december 1966 as in the body of this report, child died in hospital, not a crib death, and alan wilson was listed as the father on this report as in this posted article. seems like a lot of the points match. the linked document appeared on google images and was attributed to mary cummins who has done a lot of research on the cruz family “story”. How has the document appearing in the link been verified? following is a link to a u.s. consular report of death for michael wilson. can not imagine why the u.s. consulate would issue a consular report of death for michael wilson if they had not previously issued a consular report of birth abroad. my speculation is that she remarried in london after divorcing alan wilson and may have used that marriage to a british citizen to obtain british citizenship for herself.